A developmental pediatrician, Dr. Vibha Krishnamurthy pioneered an integrated medical and therapeutic support system for children with developmental challenges called Ummeed (Hope) in 2001. Ummeed is changing the way families, understand and care for their differently enabled children. Vibha Krishnamurthy’s foundation has benefitted thousands of families in Mumbai. Ummeed has four verticals - direct services, training, advocacy, and research. Ummeed provides medical professionals with the opportunity to work in tandem, as resident physicians, building relationships and empowering parents. The training provided by Ummeed includes underprivileged areas that may not otherwise utilize Ummeed’s services. Vibha is also partnering with citizen organizations (CO) that work with disadvantaged children in non-formal schools and nurseries. She trains teachers to diagnose disorders so that they may modify school curricula to children’s learning pace and capacity and support parents. 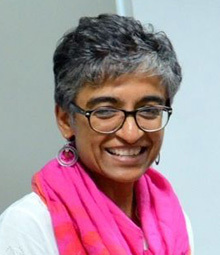 Vibha Krishnamurthy attained her Masters in Pediatrics at the Massachusetts General Hospital, Harvard in 1997 with specialization in Developmental Pediatrics. She is the Chairperson, Expert Committee on Autism, Rehabilitation Council of India, and Government of India and recognized as ‘Ashoka Innovator for the Public’ in 2007. She has received the Amazing Indian Award by the Times of India in collaboration with Mahindra Rise in recognition of her transformative work with children and their families. Ummeed was also invited by the WHO, Geneva to present their model, as an expert in Early Childhood Development. Vibha Krishnamurthy teaches, speaks and publishes widely for her vocation and is recognized as a changemaker for a better India’s changing canvas.